Tanja Lundsten had dreamt about a small red cottage with a Finnish work horse on the yard since she was a little girl. – When we moved to countryside with my family, we had a chance to get a finnhorse for lease for a couple of summers. I used to ride long trecks and tried to learn what went on in the horse’s head. I was never much of a dressage rider, I prefer riding in the forest. Life and studies took Tanja away from the countryside for a while, but she did not give up on her dreams of the cottage and a horse. Ten years ago she got to work on this dream, bought a house to renovate and looked around for a horse. – I went to see many horses, but the decision was made almost instantly when I saw Uuras. He was a trotter, even with a quite good record. I fell in love with his friendly eyes. He is still enthusiastic even as a 19-year-old, and once a week he gets to trot as fast as he wants in harness. He goes on for kilometers. We have never had actual problems with him, just some occasional battles of will, he still has a firm finnhorse will. Original text and photo by Susanna Malmström. The original text has been published in Hevosmaailma magazine. 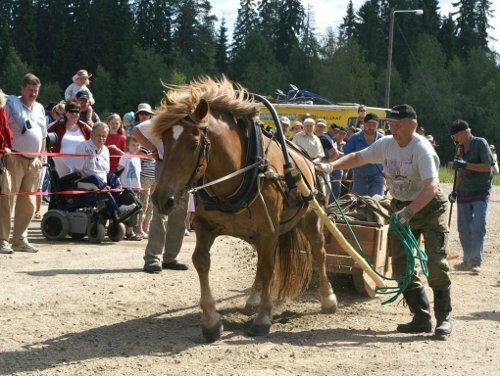 Categories: Work horse | Tags: Draft horse, Equestrian, finnhorse, hevonen, horse, suomenhevonen, työhevosharrastajat, work horse | Permalink.